Born in Montreal in 1957, Charles Carson has been devoting himself entirely to his art since 1983. He has participated in numerous exhibitions in Canada, the United States, Europe, Asia and South America. He spent his early productive years living in South America from where he gained international recognition, acclaimed by experts and art historians for his unique technique which they named Carsonism. Early in his career, the artist employed traditional techniques, gaining inspiration from his environment. His early figurative works left him unsatisfied and he started to lean towards a semi-figurative and extremely personal style of painting. This technique combined with his unique pictorial language rapidly affirmed themselves and his talent was revealed with each new creation. The artist produces extraordinary works that exhibit sensitivity, depth and liveliness, as well as dynamism and variety of composition that characterize hs work. His works are sought after by serious collectors from around the world. Carson's artistic talent has garnered him many honors and distinctions, including seven gold medals on the international stage. Other honors include induction into the Académie internationale des Beaux-Arts du Québec as Master of Fine Arts (2007) and Grand Master of Fine Arts(2013), Artist of the Year at the Montreal Museum of Fine Arts Academia XXI Gala (2009), recipient of the Leonardo da Vinci and Vincent van Gogh international art prizes awarded by Italia del Arte (2009, 2011), Grand-maître académicien at the Salon international de l'académie Européene des Arts France (2007), to name but a few. A native of Chile, Humberto Pinochet has lived in Quebec for the past thirty years. Hailing from a family of artists, he studied at the Catholic University of Valparaiso, in the faculty of architecture and the graphic design school. He is also a graduate of the visual arts program of Laval University in Quebec City. Humberto Pinochet devotes himself passionately to his painting and has participated in numerous artistic and cultural events around the world, including more than 100 exhibitions in Canada, South America, the United States and Europe. Over the years, he has participated in over 60 painting symposia across Quebec, Ontario and the Maritimes and has won numerous prizes and distinctions. He has been honored many times by the Académie internationale des beaux-arts du Québec, as academician in 2006, academician counsel in 2007, Master in 2009 and artist of the year in 2011. The Mazarine academy of France appointed him honorary lifetime member in recognition of his ability and devotion to the arts. In December 2007, he was chosen by the Salon national des beaux-arts de France to represent the Canadian delegation at the Carousel of the Louvre Museum in Paris. Traveling provides a source of constant inspiration to Pinochet. his works cover a wide range of themes and are open windows to a world that the artists invites us to discover. urban scenes, landscapes and marine scenes are among his favorite subject matters. Intense colors, wildly exotic subjects and vivid light characterize the artist's work. His pictorial universe is in constant mutation. The artist's work can be found in private and corporate collections around the world and he is represented by many of the best galleries. He has been featured in many press articles and television reports. Andrew current lives with his wife in Calgary. His work is featured in several galleries and, for the past several years, has been part of the Exposure Photography Festival held in Calgary, Banff and Canmore. Denis Moreau is a self-taught artist residing in Quebec. His deep love of nature reveals itself in his distinctive wildlife paintings and abstract landscapes. Curious by nature, Moreau approaches his art with vigor and passion while never losing sight of the sensitivity and fragility of his subject matter. The artist does not view his art as creation but rather as a reproduction/interpretation of that which nature has already created. Each of his paintings expresses his gratitude for what nature has so generously provided as well as a plea to humanity to improve its relationship with the environment. His impressionistic, idealistic, almost celestial, vision of the world transmits the energy of the environment from which he draws his inspiration. Like an acrobat without a safety net, Moreau constantly pushes boundaries. His art is replete with powerful images reflecting the force of nature juxtaposed with the fragile beauty of its wildlife. Working in multiple mediums, he confronts man and his reality. There is a duality between the artist and his subject that is particularly evident in the attention that is paid to the smallest detail. Through his singular approach to art and his personal quest, Denis Moreau is making his contribution to the evolution of humanity. Mark Laguë is a dedicated painter who has developed an international reputation and won numerous awards, both in his native Canada and in the United States. He was born in Lachine, Quebec in 1964 and he has had a fascination with drawing since childhood, a skill he practices constantly, even to this day. Upon graduation, from Montreal's Concordia University in Design, Mark embarked on a 13-year career in the animation industry, working primarily as a background designer and art director. During this time, despite working full time, he began receiving international acclaim for his watercolor paintings through competitions, juried shows and solo exhibitions. In 2000, Mark switched to oil as his primary medium and, in 2002, made the jump to full-time painter. As an artist, he is a realist who is open to virtually all subject matter. What keeps him excited about painting is his endless quest to simplify and get to the essence of whatever he paints. Mark has been featured in numerous national art magazines and continues to receive international recognition for his distinctive style of painting. Alan Briks has been characterized as an intuitive artist whose approach to visual imagery imports both impressioist and expressionist aspects. Alan's appreciation of the delicacy of light and definition of line stems from a background as architectural stained glass artist. His endeavors include abstract expressionisme, plein air painting and figurative work with wide ranging art media. Alan's studio art formation derives from studies at the Ontario College of Art, the Three Schools of Art, the Faculty of Fine Arts of York University in Toronto and the Faculty of Fine Arts of Concordia University in Montreal. Alan earned a Master's degree in Art Therapy through the Faculty of Fine Arts and Art Education at Concordia. He maintains a practice and an art studio in Calgary, is an associate professor with the Nursing Faculty, University of Calgary and has taught sessionally at the Alberta College of Art and Design. Patricia was born in Quebec where she studied Industrial Design and Business Administration. Upon relocating to Calgary, she studied at the Alberta College of Art & Design and has been an active professional artist since 2000. In addition to painting and sculpting, she teaches at the Calgary Arts Academy and privately in her studio. She currently serves on the Board of Directors of Regroupement Artistique Francophone de l'Alberta and promotes the visual arts in her local community through projects with the KO Arts Centre and an annual children's art show. In 2010, she was invited to show her sculpture project "Dare to Dream" at the Vancouver Olympics Cultural Olympiads. Her work is motivated by a personal reflection on life and its contrasts -- dualities that inhabit us and constitute an integral part of our experience, conscious or inconscious, as human beings. She uses her observation of human experience and nature to express these dualities. Through paint and sculpture, she presents metaphors that speak of our place in a world that controls us, where we are born, live and die like all other living beings but in the illusion of our own importance. Without losing sight of our place in the environment and trying to comprehend what, if any, control we may exercise, she looks for harmony and interrelationships in apparent contrasts, in movement and in color. Her work is a witness to life's emotional movements and to our unity with the environment. Veronica Funk was born on June 25, 1966 in Winnipeg and raised in Northern Manitoba. She studied art & design at Red Deer College in Alberta, apprenticed with potters, stone sculptors and painters in Manitoba and spent a year painting on a farm in Saskatchewan. She is an active member of the Federation of Canadian Artists and resides in Airdrie. Alberta. She has been painting professionally since 1999 and is currently continuing her education towards completion of her Bachelor of Fine Arts designation. Despite forays into mixed media, altered books and pottery, she has always returned to the medium that got her career started: painting. Over the years she has been the subject of numerous newspaper articles and her work has been published in a number of art books. She has also taken up writing. Her goal is to create a visual story. She combines symbols, imagery and vibrant color through the use of opaque and transparent acrylic glazes, stamping, utilizing her hands as tools and drawing with her brush. Her images are an endeavor to capture the essence of Canada. Lyse Marsan is a Quebec-born artist who has been devoting herself full-time to her craft since 1991. She began her artistic quest more than 40 years ago, studying in private workshops and public institutions before moving to Europe to perfect her skills. In France, her talent was acknowledged with an award of the gold medal for Merite et devouement francais au titre des arts in 2002. Lyse is also a member of many provincial, national and international organizations and in 2013 was honored with the distinction of Grand Master of Fine Arts by the Academie Internationale des Beaux-arts du Quebec. Lyse relies on symbolism to create dynamic environments from which dreamlike animals, charcters and prismatic colors emerge. Her passionate nature and keen perception allow her to expose the hidden truths of her subject matter. Regardless of whether she is working in oil, acrylic, pastel, charcoal, watercolor or ink, she seizes the essence of each passing moment. Over the course of his 35-year career as an artist, Terry Gregoraschuk has worked in acrylics, oils, pastels and mixed media, but he is most recognized for his high-realism paintings in watercolour. His artwork has won numerous awards and been exhibited at local, national and international levels. It can be found in many private and corporate collections, including those of the Alberta Foundation for the Arts, the City of Calgary, the Esplanade Arts and Heritage Centre (formerly the Medicine Hat Museum) and the Vancouver General Hospital. Numerous institutions have commissioned his artwork over the years, including Canada Post Corporation, Environment Canada, the Royal Tyrrell Museum, Rimrock Hotel, Bankers Hall, United Way and Canada Olympic Park. In addition to painting, Terry has also served as Artistic Director for a popular lifestyle magazine and as an instructor at Mount Royal University. In 2010, he took a four year sabbatical from painting to complete a novel, which has recently been shortlisted for a prestigious competition. Emerging from his sabbatical Terry has At the end of his sabbatical, Terry embarked on a new artistic quest with a new abstract series entitled "Reemergence". Drawing on his innate mastery of color, form and movement, Terry has produced a series of beautiful paintings that lead the viewer to believe he has been painting in this style his entire life. Jeff Cruz is an award winning fine art photographer. Jeff ’s images have been shown in local and international publications. His limited edition fine art prints have been displayed in numerous group and solo exhibi- tions in his hometown of Calgary, Alberta. In 2012, his photograph “Forever” graced the cover of the French photo magazine PhotoSolution. Jeff has been exhibiting at the Calgary Stampede since 2008. Jeff ’s non-conventional approach to photography allows him to create images that do not exist anywhere except his mind and his limited edition prints. In his most recent series entitled “Slice of Life”, Jeff strives to convey abstract expressions of life’s moments. Inspired by events in most lives, the “slices” represent parts of a life journey. The feelings and emotions gained from these life moments are shaped by colour and movement. As a whole, the work aims for an experiential journey of emotion from past memories. Brian Stone graduated from SAIT in 1974 and followed a career in architecture, construction and property development. Having painted as a hobby most of his life, he eventually earned a Bachelor of Fine Arts degree from ACAD in 2004. Inspired by history represented through art, the enduring power of the elements and personal experience, Brian is a student in the North Romantic tradition with a focus on contemporary abstract interpretation of the urban and natural landscape and human intervention therein. Through his work, Brian seeks to conceal and reveal representational forms. His mixed media paintings instill memories of nature, urbanity and humanity – prescribed within the visually active spaces and layers of reflective metal, static imagery and abstract paint. Brian resides in Calgary when he is not travelling or spending time at his Stonewater studio in Winderemere. He has exhibited in several solo shows, group exhibitions and collaborative charitable endeavors and his work is held in numerous private and public collections. Yanelis Reynaldo began painting at an early age in her native Cuba. Since immigrating to Canada, she has continued to grow and evolve as an artist under the mentorship of her husband, internationally renowned artist Charles Carson. Her most recent works on display at Inglewood Fine Arts represent the culmination of this artistic process. They are a perfect reflection of the competing facets of her personality. Her gentle nature combined with a fiery passion for her art have produced this series of beautiful abstract works marked by their vivid colours, gentle harmonies and fluid composition. James Lutzko's inspiration comes from artists such as Richter, Rothko, and the Spatial Concept, a movement of its founder Lucio Fontana. James has embarked on a series of paintings that carry the same pictorial message. By drawing on the experience of these masters he has formed a style "Spatial Expressionism". The intention of Lutzko's work is to evoke a poetic visual image where all of his paintings are inspired by and go beyond the consciousness. The purpose of his work is to bring forth a spiritual landscape in which colour, space, movement and time touch upon the soul itself. Yann Anthony Carson was born in 2006 in Montreal. Despite his young age, he displays a calmness, passion and maturity beyond his years. 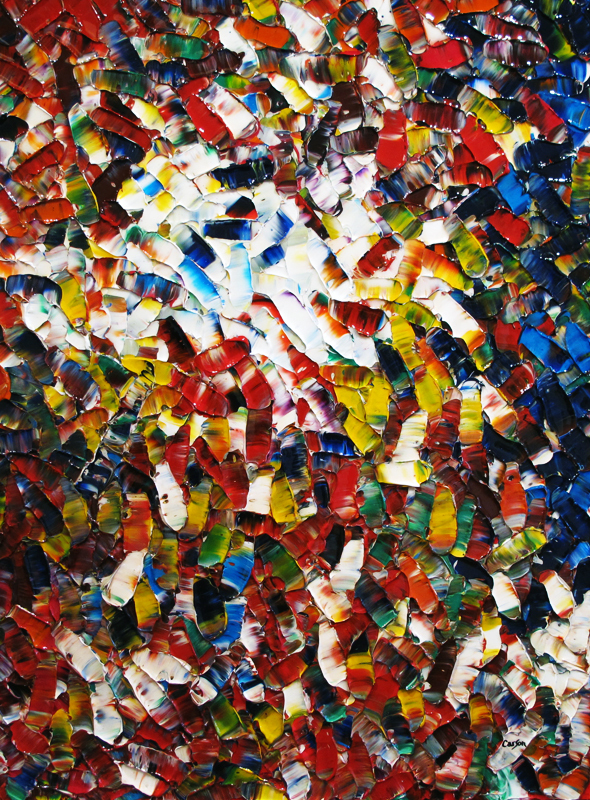 These qualities are reflected in his abstract art which display a remarkable mastery of colour and form. Son of internationally renowned artist Charles Carson and Cuban artist Yanelis Reynaldo, Yann has been surrounded by art his entire life and was fortunate to have the opportunity to develop his artistic talents in a nuturing atmosphere from a very young age. His extensive travels with his parents to many corners of the world have also provided an inestimably rich cultural experience that has stimulated his imagination and opened his spirit to novel ideas. Yann recently became the youngest member of the Académie des beaux-arts du Québec. Inglewood Fne Arts is pleased to represent this young promising artist. Nancy Stella Galianos is a self-taught artist born in Montreal to Greek Canadian parents. Through her contemporary and abstract expression, she conveys a repertoire of emotions through her sensitivities to the colors and brushstrokes that she applies on her canvases. Her interest in drawing and painting was stimulated in her early childhood and adolescence spent in the urban atmosphere of New Jersey. Influenced and encouraged by her art teachers, her creative vision was nourished by the diversity of her experiences. Back in Quebec in the late ’60s, Nancy participated in various art workshops at the Museum of Fine Arts in Montreal. A few years later, she completed her studies in Studio Art at Concordia University and then studied Communications at the University of Montreal. Following her studies, Nancy embarked on a business career while continuing to paint in her spare time. Travels to Europe and South America enriched her culture and sensitivity, giving essence to her art. Since her retirement in 2010, Nancy is fully dedicated to her art, creating a universe of a dynamic interpretation of different images with defiant bold colours and strokes, expressed via an elixir of emotion and energy. Each of her paintings is a passionate adventure leading to constant effervescent evolution. Paintings held on consignment for clients of Inglewood Fine Arts include works by artists Pauline Paquin, Albini Leblanc, Anne-Marie Bost and Barbara Goodman.